Daily Illuminator: Take A Trip To Castle Falkenstein! 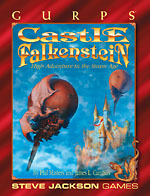 May 21, 2012: Take A Trip To Castle Falkenstein! Newfangled methods have their place . . . but for awesome adventure, never underestimate the power of magic and steam! Newly revealed to e23 (at great personal peril to our diplomats), GURPS Classic: Castle Falkenstein delivers what you need to visit the classic Castle Falkenstein setting. It's a 19th century world that's just like ours was! Well, except for the wizards, Dragons, Faerie, steam-tech, swashbucklers . . . okay, it's a much more interesting world than ours ever was. Investigate the intrigue, learn the truth behind the writings of Verne and Shelly, and live the adventure of a world where steam meets magic. Fire up your analytical engine and pick up GURPS Classic: Castle Falkenstein today . . . lest the sacrifice of our brave diplomats be made in vain!